Please Spread Word to Friends and Family! 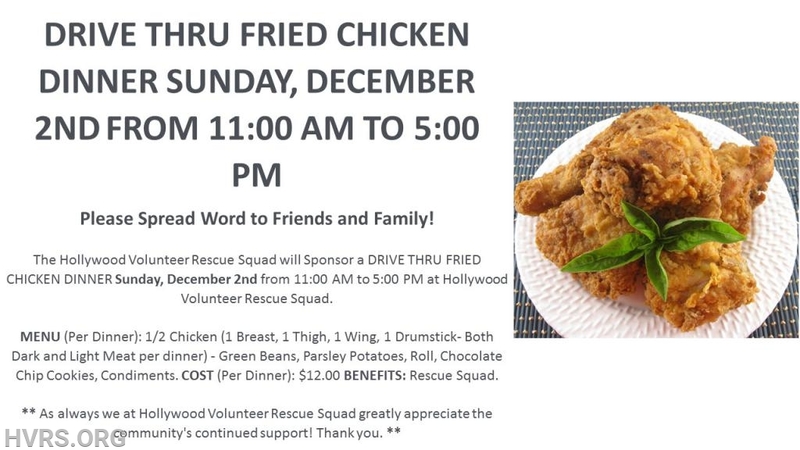 The Hollywood Volunteer Rescue Squad will Sponsor a DRIVE THRU FRIED CHICKEN DINNER Sunday, December 2nd from 11:00 AM to 5:00 PM at Hollywood Volunteer Rescue Squad. MENU (Per Dinner): 1/2 Chicken (1 Breast, 1 Thigh, 1 Wing, 1 Drumstick- Both Dark and Light Meat per dinner) - Green Beans, Parsley Potatoes, Roll, Chocolate Chip Cookies, Condiments. COST (Per Dinner): $12.00 BENEFITS: Rescue Squad.